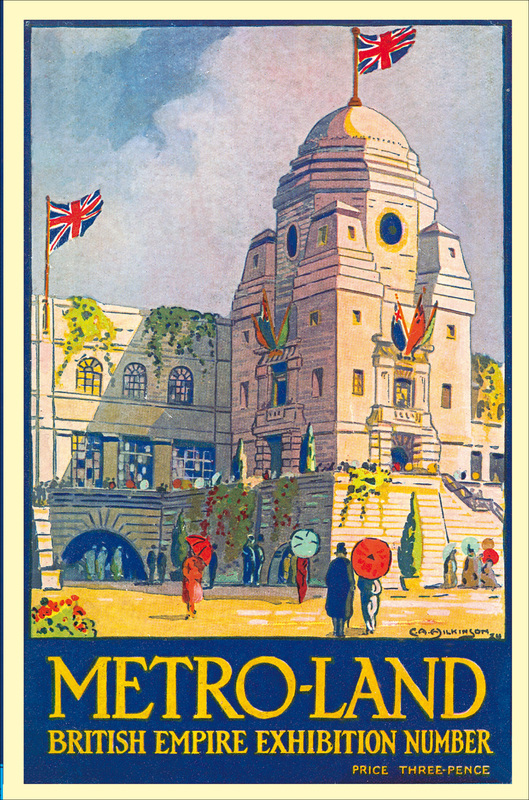 The concept of Metro-land was created by an employee of the Metropolitan Railways’ marketing board, James Garland, around 1915. The Metropolitan railway had expanded their lines from Baker Street, out to the villages of Wembley and Harrow and beyond to towns like Aylesbury and Amersham. To accomplish this, they had to purchase large tracts of land from farmers and landowners either side of the proposed line. After the line and new stations had been built, they decided to build homes on the left over land. The homes would be affordable and spacious compared to the inner city terraces of London. The new houses were aimed at the lower middle class workers such as bank clerks and office workers who lived and worked in London, but wanted a quintessential piece of the English countryside for a home. This idea was a roaring success, and in the first thirty years of the 20th century the populations of villages such as Pinner and Harrow Weald grew by 800%. The population explosion in these areas necessitated the building of various infrastructure such as hospitals, police stations and schools, as well as more commercial buildings like cinemas and factories. Being the invention of a marketing department, Metro-land has no defined boundaries. Indeed the annually produced guide to this invented region, Metro-land, defined it as “a country with elastic borders that each visitor can draw for himself”. Traditionally, the area of Metro-land is thought to spread out in a triangular shape from Baker Street station through the North West of London, and up to the counties of Buckinghamshire and Hertfordshire. More strictly it can be traced along the route of the original Metropolitan railway, (not exactly matched by the current Metropolitan underground line), from Baker Street up to Wembley, through Harrow and then Pinner, Amersham and up to Aylesbury. The poet and architectural critic Sir John Betjeman is closely associated with Metro-Land, mentioning it in several of his poems and making a 1973 documentary called, Metro-Land. There were two main architectural styles that dominated the new constructions of Metro-land, Tudorbeathen and Modernism. Tudorbeathen was a revival mixture of Elizabethan, Tudor and Jacobean element that fitted in with the Arcadian idealism of the Metro-land theme. This style was used for most of the houses built in the area. Nevertheless there was a contrasting style used to build many of the more functional buildings in this area, that of Modernism. In terms of its application to architecture, Modernism was developed in the early 20th century by a variety of architects and locations such as Frank Lloyd Wright in Chicago, Antoni Gaudi in Barcelona and Charles Rennie Mackintosh in Glasgow. In the 1920’s a new wave of architects took on the ideas of these innovators and developed it into the style which came to be considered Modernism. This new wave included Le Corbusier in France and Mies van der Rohe and Walter Gropius in Germany. Their designs, which became known as the International Style, featured square or rectangular facades, flat roofs and strong angles or rounded corners. The philosophy of their architectural style took as its motto “Form follows function”, meaning that the design and materials used for their buildings grew out of the purpose of the building. The type of modernism that took hold in Metro-land was not of the same style as the harsher European style. Many of the modernist buildings designed during this period took inspiration from Art Deco, as well as modernism. Art Deco had appeared in architectural terms at the end of the First World War in France and spread through Europe and the Americas over the next twenty years. Art Deco architecture utilizes geometric designs, bold colours and a use of glass and plastic to produce a fresh and futuristic style that became part of the inter-war Jazz age. Again, the version of this style used in Metro-land was more pared down, with less emphasis on the decorative and more on the curving forms and long horizontal lines. Just as the Tudorbeathen style was used for the houses of Metro-land, more modernist designs were used for public and practical buildings like cinemas, tube stations and schools.